For those of us who like to hoist huge weights, knee problems are virtually inevitable. Soon, even the simplest of movements become riddled with pain. [caption id="attachment_5354" align="alignleft" width="400"] Pic: Thomasbondphysio[/caption] Always take care of your knees. Warm up sufficiently before any form of exercise. Start with a brisk walk or slow jog; followed by some gentle stretching of all associated muscle groups. Never work out cold muscles. Only stretch until you can feel the tension, and NEVER bounce while stretching. Begin leg day gently. You can start by doing a high rep set, or try two reps of leg extensions with a light weight. This will get the blood flowing into the quads, and prepare your knees for the onslaught ahead. When squatting, begin with just the bar. Concentrate on your form, and use the mind-muscle connection to carry through your main workout. Wear lightweight strapping, or some form of knee supports, right from the start of your leg workout. Even just a little extra support can make a lot of difference. When you get to the heavy end of the session, wear heavier duty strapping. Proper powerlifting knee wraps provide the best support, and you can custom fit them to your legs at the tension you require. Always listen to your body. If something doesn’t feel right, ease back, give it a stretch and shake it out. When you feel ready, gently try again. If it still doesn’t feel right, stop whatever you are doing and take a break. Too many long term injuries result from people ignoring pain and discomfort and ‘battling through’. Pain signals exist for a reason! Do not ignore them. Knee injuries can take a long time to heal; partly due to the fact that total rest is virtually impossible, and partly due to the complex array of tissues involved. Many of these tissues have a poor blood supply, which results in a poor supply of tissue repairing nutrients. If you have a history of knee issues, you should tailor your training, accordingly. Spend even more time warming up, and avoid any exercises that cause aggravation. You may want to knock squats out of your routine for a while, and try the leg press. Leg presses work better in these instances,because the exercise provides increased stability of movement. Never take your knees beyond 90 degrees, if you have weak knees or a history of injury, as the pressure on the fragile joints increases immensely past this point. 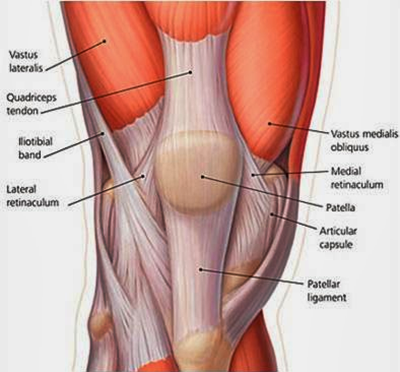 Tight and shortened muscles commonly cause knee pain. Regular sports massages help to keep problem areas like the hamstrings nice and supple. Yoga also improves and maintains flexibility; thereby taking pressure away from the knees. Post-workout nutrition also helps to repair tissues and prevent overuse injuries. Sheer Strength Labs Sheer Recovery offers a superb post-workout supplement, designed to provide your body with all the nutrients it needs for optimum recovery and growth. This potent mix of ingredients will help your body to begin rebuilding the second you leave the gym. If you suffer, or have suffered from knee problems, just resting up and waiting until you can get back into the squat rack rarely provides the recovery you need. You must engage in active recovery as soon as possible. Always consult a healthcare professional before beginning any kind of resistance training. However, once any swelling has disappeared, and a good range of pain-free motion has been restored, you can begin to apply gentle exercises and other techniques. Remember to wear lightweight strapping at least at first to provide your knees with extra support. These exercises can benefit anyone, regardless of injury status. The one dimensional aspect of weight training, often leaves the knees and associated muscles, open to strains and injuries - especially the groin and hamstrings. As a result, running your knees through a more comprehensive range of movements from time to time helps to keep them healthy. Remember, these exercises are not designed to be strenuous. Use them to gently strengthen the knees in all areas. 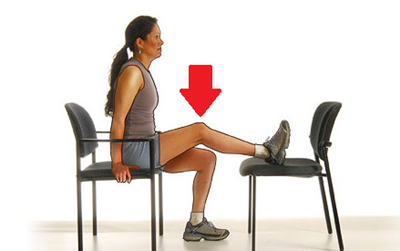 [caption id="attachment_5352" align="alignleft" width="400"] Pic: webmd[/caption] This very simple exercise fully extends the knees, stretches the connective tissues and engages all associated muscles. Simply sit on a chair, with another chair opposite, as pictured. Contract your leg muscles, and push your knee towards the floor. Hold your leg as straight as you can keep it for 10-15 seconds and then release. Repeat 5 times per leg. [caption id="attachment_5353" align="alignleft" width="400"] Pic: mosaic life-care[/caption] This exercise takes the knee through its complete range of flexion. Sitting on the ground, place a towel under your heel as pictured. Now pull gently, while flexing your knee as far as you can without causing discomfort. Hold this position for 10 seconds. Repeat 5 times per leg. [caption id="attachment_5356" align="alignright" width="400"] Pic: nomeatathlete[/caption] Tight and swollen shin muscles can cause imbalances in the knee that may lead to injury. Common ailments, such as shin splints and compartment syndrome, may result from not addressing this issue. 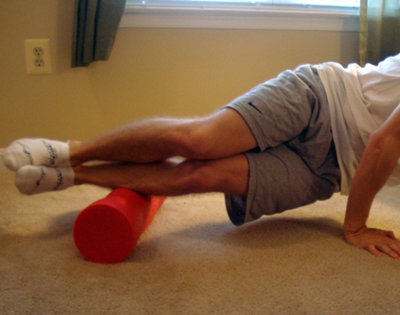 To effectively relieve tension in your shins you need a foam roller (pictured). Begin in the press-up position and simply roll your shins up and down the roller. Then, work your lower legs from all angles. You will feel the muscles loosen very quickly. In order to effectively clear lactic acid from your muscles after exercise, keep yourself adequately hydrated and fuelled with a good supply of antioxidant vitamins and minerals. Sheer Strength Sheer Total Multi-Vitamin created a product specifically for men. This superb supplement is designed with bodybuilding and strength training in mind, and provides your body with all it needs to cleanse, repair, and grow. [caption id="attachment_5357" align="alignleft" width="400"] Pic: ukolympicweightlifting[/caption] Leg extensions strengthen the entire knee area. If you are recovering from an injury, use this exercise first to ease yourself into training again. Begin with very light weights and focus on taking your knees through their full range of motion. Lift slowly for a one second count, hold at the top, then lower for a 3-4 count. Do not swing your legs or use momentum. Focus on proper form and use only muscular force. 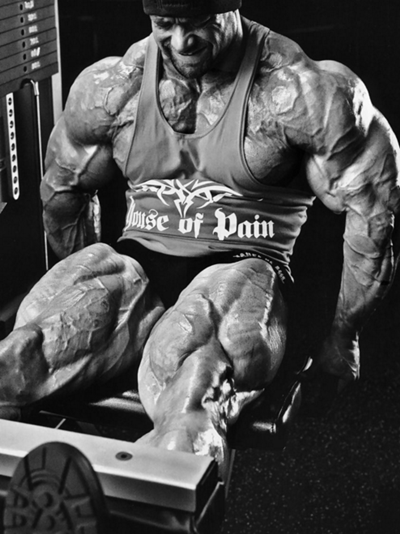 Do some ultra high rep sets to really get the blood pumping into the quads to support the knee, then build the weight gradually. Many fitness enthusiasts see abduction and adduction as very female exercises in the gym. But, they can help to strengthen the legs in all directions, as well as improve all round development. They make an excellent addition to your recovery routine. Remember, look after your knees and listen to your body. At the first sign of trouble, stop, assess, and fix!